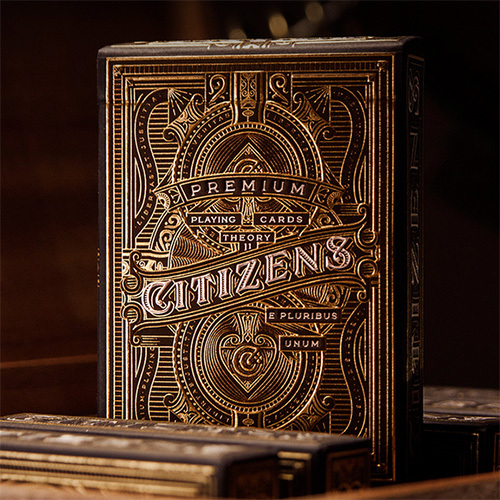 Citizens are the most intricate, breathtaking playing cards produced by Theory11. Illustrated by Kevin Cantrell, every aspect was handcrafted with relentless, unrivaled attention to detail. Citizen are luxury Playing Cards made in the USA using FSC-certified paper derived from sustainable forests. For the first time, Theory11 combined gold foil, hot stamping, and bronze foil to create a box design that’s eye catching, elegant, and sophisticated. Even the inside of the box has a breathtaking, intricate guilloche pattern. The Joker and back design bear the Latin phrase “Audentes Fortuna Iuvat” - Fortune favors the brave - The Ace of Spades features an iconic Citizen “C” emblem. • The cards are poker size. Αυτό το προϊόν προστέθηκε στον κατάλογό μας την Tuesday 12 April, 2016.